Online Government Jobs applications are invited from all eligible and interested Indian male candidates only who are possessing required educational qualification and age, as prescribed below in this article as well as in the official Advertisement. We explain all these criteria on the basis of the official Advertisement. Indian coast guard recruitment department is going to filling up the vacant posts of Yantrik in the Indian Coast Guard, an Armed Force of the Union. So those who are eligible and interested in these Government jobs can apply online through the official website only. We share the official links below under IMPORTANT LINK Section. Read the article carefully before moving to IMPORTANT LINK Section at the end of this post. Number of Vacancies: Not Mentioned. What are the Eligibility Criteria for this Indian Coast Guard Recruitment? Education: Those who have a diploma in the following trades: “ Electrical/ Mechanical/ Electronics and Telecommunication (Radio/ Power)” approved by AICTE with at least 60% marks can apply for this Indian Coast Guard recruitment 2018. Age Bond: Candidates age must lies in between 18 years to 22 years for applying these Government jobs in India. What are the various Medical Standards Required? Balanced to height and age + 10% acceptable. 6/24 without glasses and 6/9 & 6/12 with glasses for Better Eye and Worse Eye respectively. Various Physical Fitness Test for this Recruitment? 1. Indian coast guard recruitment department will conduct a race of 1.6 Km which candidates have to complete in 7 Min. time interval. 2. 20 squats up continue (Uthak Baithak). What Application Fee for applying this Indian Coast Guard Recruitment? Department is inviting all Indian candidates for applying this recruitment process without paying application fee. Zero application fee for applying these Government jobs in India. 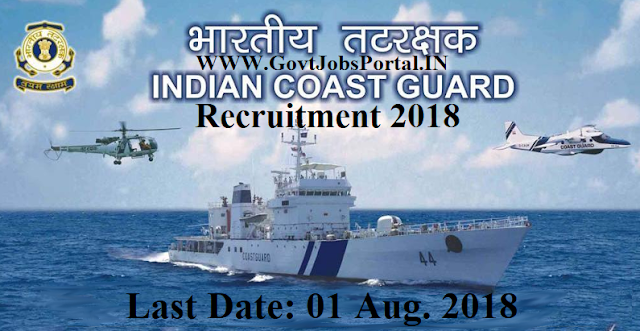 What is the process for applying this Indian Coast Guard recruitment? Those who satisfied all eligibility condition which we explained above and interested in these Government jobs can apply online. The process for accepting online application will be activated on 23rd July 2018 and remain activated up to 01st Aug. 2018. So interested candidates for this Indian coast Guard recruitment have to apply between these dates. 23rd July 2018 starting Detail for applying. 01st Aug. 2018 is the Last Date for applying online.